이준문 선생님 게시판에 오신 것을 환영합니다! 강의자료가 5강부터 올라와 있지 않습니다. 확인부탁드립니다. 제목은 newton's law라고 되있는데 영상에서는 models of the atom이 나와네요. 확인 부탁드려요. Welcome to the Q&A board! Feel free to ask any questions you have about the SAT/ACT, college admissions, our courses, and more. - If you wish to ask a question to / about a certain instructor, click on their name in the drop down menu. - If you wish to ask a question about a certian course, click on the course in the drop down menu. - If you wish to make your post private (only you and the instructors will be able to see private posts), check on the 'Private' checkbox at the top right. - You can add up to 3 attachments. *The Q&A board is mainly for study-related topics. Please use our contact form or call 1600-1517 (Korean) for troubleshooting. 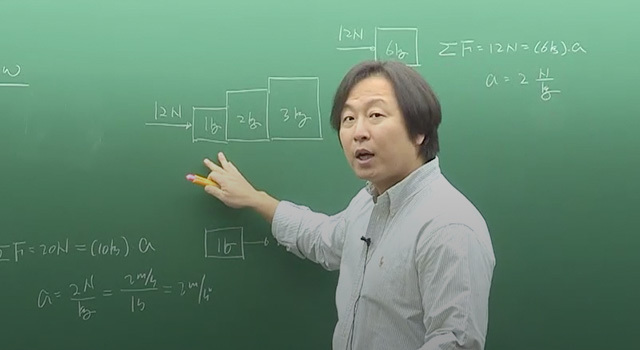 Joonmoon explains simply how position, displacement, velocity, & acceleration questions with minimal math. 오직 쉬운 수학공식만을 이용한 물리 강좌가 나타났습니다 . 불필요한 수학을 빼고 반드시 나올 문제만을 다루어 효과적인 물리 공부를 도와드립니다.